Old iMacs don’t die. They become lamps and fish tanks in Nebraska. 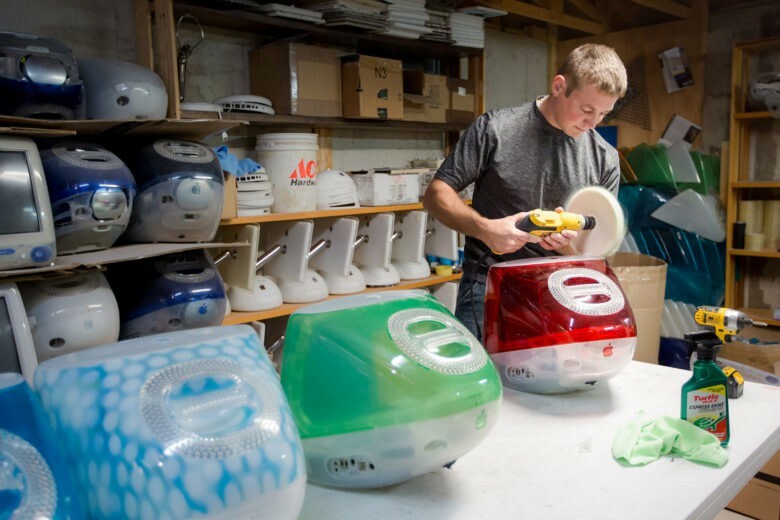 Jake Harms in his Nebraska workshop, where he turns old iMacs into home furnishings. Jake Harms was on his way to the warehouse when a supervisor asked him to take a cart full of garbage to the dumpster. On top of the cart was an old indigo blue iMac G3. Crossing the warehouse floor, Harms needed to turn left toward the dumpster. Instead, he steered the cart right toward the parking lot so that he could offload the broken iMac into his car. That rescued iMac would become the first of more than 700 to get a second life as an aquarium. That Harms has created a global side business repurposing old Apple computers into eclectic home furnishings does not surprise his friends in Hildreth, Neb. (population 262). Folks may say, “Jake’s working on another weird project” the way a church-goer might ask, “Is the Pope Catholic?” The tone implied is a resounding, duh. Harms, a carpenter during the work week and wedding photographer on weekends, chuckles and admits he doesn’t watch much TV. That time is spent in a workshop making iMac aquariums, packaging DIY kits, making iMac desk lamps and clocks and, coming soon, an ant farm from a flat-screen iMac G5 monitor. 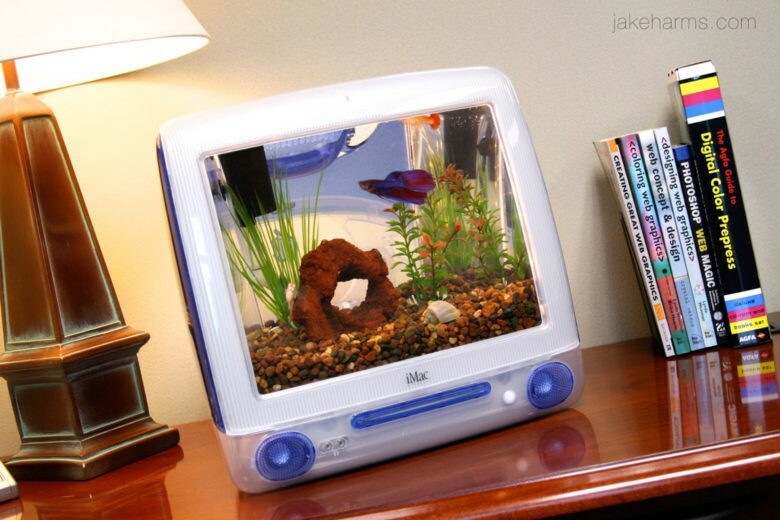 An iMac aquarium created by Jake Harms. Examples of converted computer monitor fish tanks can be found with a simple search on Google. Harms’ work generally shoots to the top of the search, in part because he has been at it since 2008. Harms refined his polishing process to make the housing look new, and found a company in Omaha that could make the 3-gallon acrylic tanks so that the front would curve like the old iMac screen. When he began, he collected and purchased as many old iMacs as he could find, built 50 aquariums, set up a website and figured he’d be happy if he sold them within three years. All 50 sold before one year was out. The orders came in from all over the world. 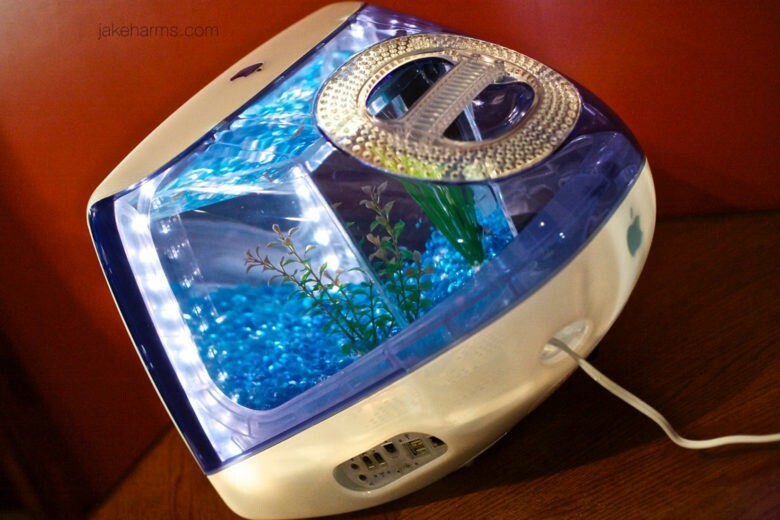 Harms sells built aquariums or a DIY kit for fans to convert their own iMacs. His prices had to go up. The colorful iMacs, the very machines that ushered in the Jony Ive era of industrial design at Apple, were becoming harder to find and so his search to buy or pick up donations took him farther away from home. The finished aquariums run $349 and $399, though he does have a DIY kit for $189 that includes an instructional video on how to polish and assemble. Dozens have been made out of the more ubiquitous blue, but in the case of a rarer color, like tangerine, he has only made four. The G4 makeover that ends in a desk lamp. 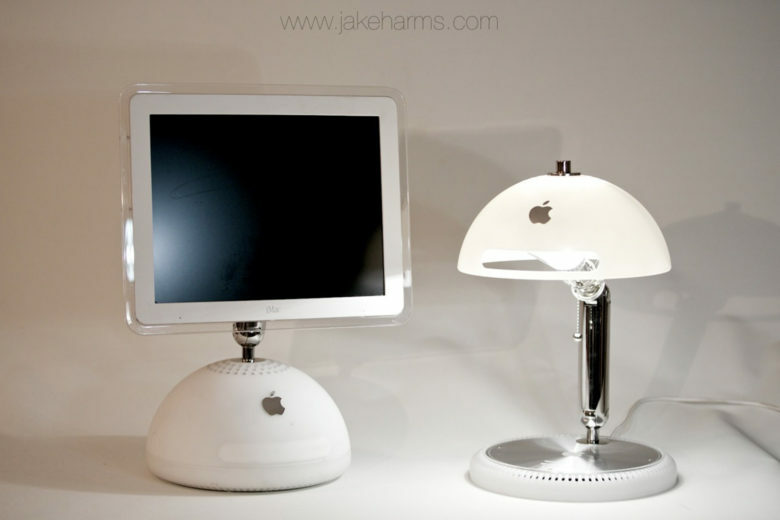 As Harms searched for discarded computers, he acquired some G4 Apple iMacs and immediately saw the possibilities in the white bulbous base. Soon, he began making lamps, the frosty base providing a perfectly round, light-defusing shade. The lamp includes a USB port for iPhone, iPod or iPad charging, and Harms made sure other details like the pull chain and braided cloth cord would meet the refined tastes of a fan who also likes elegant home furnishings. The lamp costs $399 ($10 more if you want one with the G4 mouse), and a DIY kit for $150. Schools unloaded eMacs on Harms, but the shape of the monitors did not make the best aquariums. However, in the eMac’s disc drive tray cover, he saw an elegant frame for an analog clock. The round clock, inset to the far right, has a chrome bezel to match the chrome of the Apple emblem. It sells on Harms’ website for $29. The shrinking supply of those first iMacs means Harms can’t be fussy about the condition of the machines he acquires. 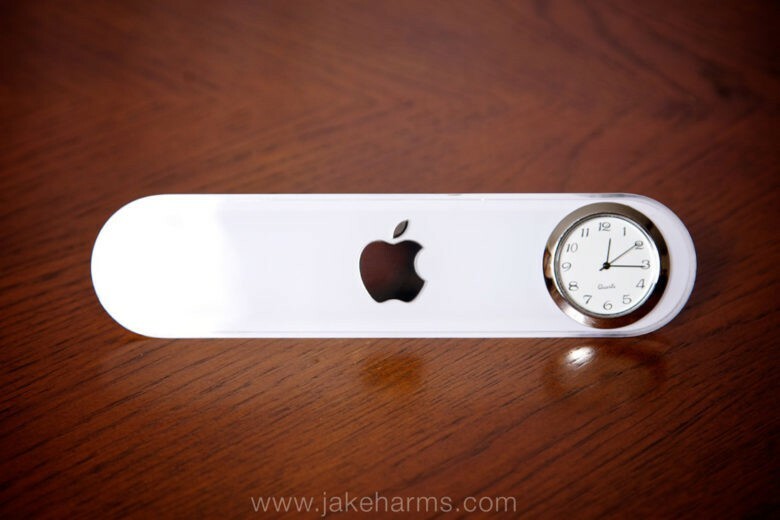 The eMac’s shape was not ideal for a fish tank, but Harms found a piece that would make a clock for the Apple fan. As a carpenter and natural tinkerer, he has a shop loaded with tools and other supplies to repurpose each piece with precision. Unless you can arrange a visit to his home in Nebraska, Harms’ attention to detail is hinted at in the picture of his well-organized shop above as well as some of the videos on his website. On Monday, Harms was installing a new door on a home that he had to finish in time to run by the post office to mail five aquariums or DIY kits. One was headed to New York, another to California. Two others were en route to the United Kingdom and one to France. When the wedding business and carpentry work slows down this winter, Harms will go to work on creating an ant farm and an idea for a new clock, which uses the side panel and part of the handles of a G4 tower for a clock with a mouse serving as a pendulum.